Hello, it's Martine here, and welcome to Episode 24 of The Teaching Space podcast. 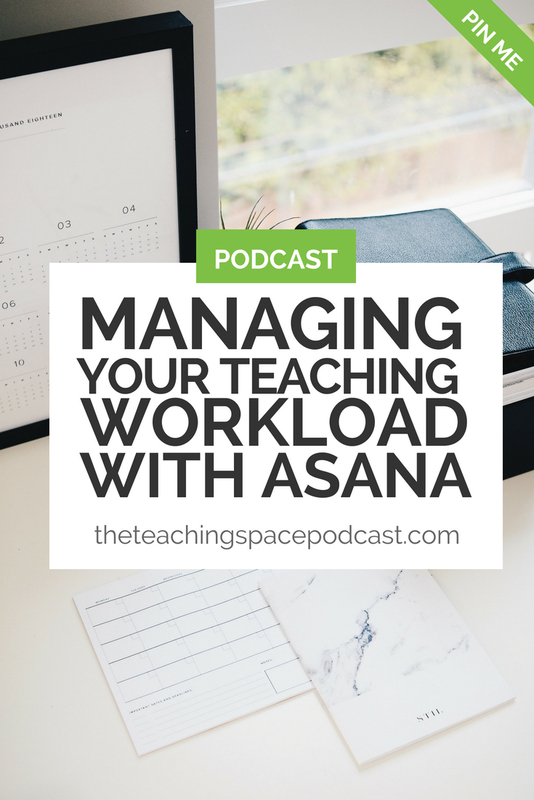 Today I'd like to talk about how I use Asana to manage my teaching workload. Actually, I'm not just going to talk about my teaching workload. I use Asana to manage my entire life. I use it in combination with some other apps, but ultimately Asana is the hub of everything. So I've tried pretty much every task and project management tool out there. After lots of trial and error, I settled on Asana. But I must give an extra special runner-up style shout-out to Trello. Trello is a really good project management tool. I think Asana is a little bit more complex, but also a bit more powerful. So if you're looking for something slightly more simple then go with Trello, it's very visual and does similar things but in a different way. In this episode I want to talk about a few of the principles I use to manage both my teaching and home workload, even though Asana is my tool of choice, these principles could be applied to any project management tool quite easily. But I will just tell you a bit about Asana in case you've wondered what it is and how it works. This is a very brief overview. You can find Asana at Asana.com; it is a web and app-based freemium project management. When I say freemium I mean there is a free version and you can pay to get additional features. Have to say, the free version is excellent. The paid version has some nice features, but they are the sort of features that might appeal to somebody with a large team of staff and a large business. So for a teacher or trainer, even if you are self-employed, the free version of Asana is likely to do the vast majority of things you need. For example, I work with a virtual assistant. and she's part of one of my Asana projects for the podcast, and I assign a task to her via Asana in that way. So you can, with the free version, work with a team if you want to. You can set up multiple workspaces with Asana. So I have a workspace set up for home and that covers everything from my meal planning to my business activities that I do when I'm not in my day job, my teaching job, and then I have a different workspace for my teaching job. For me, those two separate really nicely. They're about my physical location, so when I'm physically at home I'm doing things that are like meal planning and doing the podcast and that sort of thing, and then when I'm physically in my day job office, I use my other workspace. I hope that makes sense. I don't think I explained that particularly well. But my workspaces are essentially based on my physical location. You might find it works better for you to have just one workspace, and I can totally understand that, because if you have one workspace you can get a very big picture overview of what your commitments are. Depending on how your Asana is set up, everything is separated into projects, tasks, and sub-tasks. If you have an email address that's your own domain, for example, I have @theteachingspace.com, so my email address is hello@theteachingspace.com. If you have that setup you can get an extra layer of organization, which is teams. So it goes: teams, projects, tasks, sub-tasks. You can't see this, but while recording the audio I'm doing some quite vigorous hand gestures just to really explain to you what I mean. As I mentioned just before, one of the great things about Asana is, you can work with colleagues, staff, whatever your setup is, and delegating tasks is nice and easy. Asana also integrates with your Google calendar. That integration isn't as good as I'd like it to be, but I do have a workaround, which I'll mention to you in a moment. You can also view your tasks within Asana in a calendar view, which again, can be nice and helpful. For me, the best view on Asana is called My Tasks, and what that is is an overview of all your projects, and your tasks are pulled in to that particular view with due dates, and you can reorganize them in there. That's the thing that I am constantly looking at. So that's my very brief overview of Asana. I understand it's quite a visual thing. You can find the video here. These are my seven tips for managing your workload through Asana or an alternative project management tool. If something's not in Asana, it doesn't exist, it does not happen. One of the main reasons people fail with project manage tools is they simply don't use them properly. If you don't put every task you have to do into your project management tool, things aren't going to work properly. A question I'm often asked, and it's related to this principle, is, "What do I do with events? Do I put events into my project management tool?" The answer is no, all of my events, meetings, appointments, that sort of thing, they go into my Google Calendar. If there is work to be done in preparation for those events, then I will create a project or a task, whatever's appropriate, in Asana, and I will tie in the due date to the date of my appointment. But my rule of thumb is, events go in Google Calendar, tasks go in Asana. Always have Asana or your web based project management platform open in your browser, constantly update and check it. In the same way that if you don't book your tasks into your project management tool, if you're not checking it regularly and ticking things off, it's not going to work. It should be the place that you go first thing in the morning, last thing at night, and you're constantly checking in throughout the day. Number three is an Asana specific one, use the My Tasks view to organize your day and to overview what you've got coming up in the near future and the distant future. This is an underutilized view in Asana by a lot of users. So if you already do use it, check out My Tasks and make sure you're using it in the most efficient way possible. 4. Create Workflows and Templates For Frequently Repeated Processes. This is going to work for any project management tool. I used to do this in Trello, I do this in Asana. I'm going to give you an example. When I create a podcast episode there are lots and lots of different steps, and some of those steps are done by me and some of them are done by my virtual assistant. So what I do is I create a long list broken up into subheadings of each task that needs to be done, and every time I'm dealing with a podcast episode, I copy and paste that process into a new task. This saves so much time. So be thinking about whether there are any processes that you repeat that could benefit from having a workflow or a template like this. Number five is a little bit controversial, but bear with me. There are lots of Facebook groups dedicated to specific project management tools and techniques. It's a great idea to join some of these in order to get tips and tricks on how to use your chosen tool as effectively as possible. By having all of your tasks in your project management tool, you have a really good idea of what needs to be done today, over the next week, and in the future, and you should have a good idea of how long these things are going to take. Because they're all in one place, when someone asks you to do something and you can see you simply don't have time, it becomes a lot easier to say no. Practice with me now, come on, "No." It is a word I don't say often enough, but I'm working on that, I am learning. That is definitely a benefit of using a tool like Asana. Trello is a great example, it integrates beautifully with other tools. Asana I'm currently using in conjunction with HourStack, which you'll find at hourstack.io. HourStack enables me to use the time blocking technique for managing my workload. I'm trialing it at the moment. It is a paid product, it's about $6 a month, something like that, but I'll make sure there's a link on the show notes, if you would like to check it out. So integrate your project management tool with other tools to make it even more powerful. I'm really interested to hear from you if you use Asana or if you use a different project management tool, or if you don't use a project management tool but you really want to. I'm giving serious thought to putting a course together aimed at teachers and trainers probably about Asana, but I do have the experience of Trello as well, so that's an option too. But if it's something you might be interested in, then drop me a line, I'd love to hear from you. Probably the easiest place to chat to me is in our Facebook group, that's The Teaching Space Staff Room, it would be great to see you in there. Right, that's all from me today. I hope you've enjoyed the episode. Before I go, pretty please could I ask you to consider leaving a positive review on iTunes about the podcast? Because what that does is, it enables more teachers and trainers to find The Teaching Space podcast, and I would be forever grateful. Thank you so much for tuning in. I hope you'll join me next time.